If you know what goes into making a top quality engraved stone, you can decide what is right for you. All engraved rocks are not created equal. When you understand what it takes to make a top quality engraved stone, you are on the path to selecting a lasting piece of art as a welcome stone, wedding or anniversary stone, garden memorial, or landscaping accent that you can be proud of for generations. First, you should know the difference between "etching" and "engraving," especially when it comes to high quality craftsmanship in engraved stones. Anyone, at any age, with or without any skills at all, can "etch" a stone. Very few people can deeply carve a stone to perfection. Deeply engraving stones is truly an art and the finished product should evoke feelings of awe and wonder. When you are investing in an important piece of engraved stone art, you should spend some time looking closely at what is available so that you can make the right choice. Six of the most important processes that it takes to create the world�s finest engraved river stones are briefly explained below. 1. Hunting for and selecting only the most beautiful river stones available. This is no easy task. Many people may believe that a rock is a rock and any rock will do, but that is not true at all. If you take a minute to compare quality and overall appearance of natural river stones, you should be able see the important differences between them. Only the very best stone engraving companies will go to the great lengths it takes to select only the very best river stones. They will only select the "cream of the crop" river stones. This involves a lot of travel time, hunting time, and physical labor. It is all about taking the time to do it right and you really can't rush it. It also takes a very keen eye for finding just the right stones. The stones need to be of the right overall size and shape. They also need to have the right grain size, a smooth surface, good color, and they need to present themselves well to the viewer. It is a tough job and many people simply can't do it. A top stone engraving company knows that buying stones in bulk and having them delivered never works; the quality a discerning stone engraver requires is simply never there in a bulk order. 2. Properly designing the layout of the engraving. 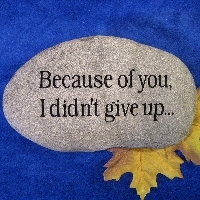 This is not as easy as it sounds, if you want the very best possible quality in your engraved stones. Simply typing the text into a computer program and slapping it on a rock isn't a good idea if you want the most beautiful outcome possible. If the engraver simply types in your text, a computer isn't going to set your letters properly because it sees lettering differently than humans do. It is important to typeset every single letter to make sure that it�s right. After setting the text, comes the sizing, proper breaking of the lines, spacing between the lines, proportionally adjusting the text, and fine tuning the entire layout. In addition to text is the tasteful incorporation graphics and/or accents. Tastefully bringing together text and graphics is the key to getting engraving layouts done right. Any top-notch deep carver of stone will always set limits as to how small they will go with detail. Tiny detail will fly away during the engraving process and that's never a good thing. 3. Choosing the right river stone for your engraving layout sounds easy. This may sound easy, but it is most certainly not! Certain things to be engraved simply will not work on certain stones. Knowing what will and won't work on any stone only comes from experience. This is a very important component to the artistry of natural stone engraving. Each and every stone must be evaluated for both its intrinsic qualities and how best it will work for the engraving to be carved into it. 4. Properly placing the engraving on the stone may also sound like an easy thing to do. Again, this is not as easy as it may sound. A highly skilled stone engraver takes the necessary time to ensure that the engraving is properly positioned on each stone. Because and every river stone is unique, this is challenging. Only after properly evaluating the characteristics and qualities of a stone should the properly designed engraving be positioned onto it. This means that that the engraving will be centered and level, with a tasteful border to the edge of the stone. It takes a fine eye to get it right. Perfection should always be the goal. That means that you carve away the stone, spot-on, deeply, and to the proper depth. Text should be carved to a finely chiseled "V" in the bottom of the engraving. That is the point at which nothing greater can be achieved. To deeply carve into stone, the engraving artist must go far beyond mere "etching." Etching a stone is easy because it is really only scratching its surface. 6. Adding contrast to the engraving. In addition to the six basic processes listed above; there are many other techniques and considerations that go into creating the world�s most beautiful deeply engraved river stones. But, hopefully, you now have a better appreciation for, and will look much more closely at, every �engraved� stone you see in the future.